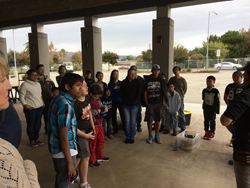 RAFT (Resource Area For Teaching) and members from the Orchard School community together created a new makerspace. With the help of Project Ember, the group of students, parents, teachers, school administrators, and RAFT employees transformed an old, unused locker room into a space where making supplies can be found for use by the entire student body. The day began with Project Ember’s safety training and explanation of reverse engineering to provide students the knowledge and encouragement to work as autonomously as possible. Project Ember is a Bay Area Maker Camp dedicated to stoking kids' creativity, confidence and sense of community through the creation of large scale projects. RAFT provided a broad collection of containers which students transformed into storage solutions. They sorted a cornucopia of donated materials, organized, and stocked their new makerspace. Classes and groups of students will be able to visit their makerspace and collect materials useful in prototyping their own designs.